She closed her eyes and remembers life, long ago. I will rise from the ashes. A great queen I was and shall be again. A cry shall arise from the land, calling me from the antiquity of time. I will hear and answer to the calling of my name, I shall rise, in Phoenix. In the glory, the beauty, and the power of the gown, I wear, I shall rise, like the bird from the colorful burning embers of the ever changing fires of time, I shall rise in Phoenix, as the true queen I am. 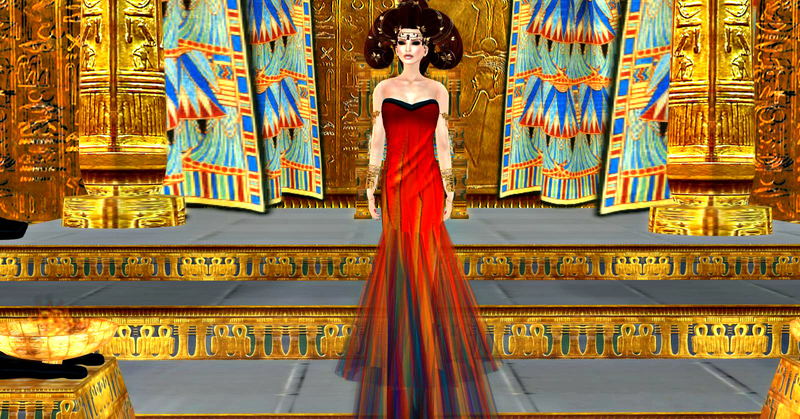 Be as a queen ascending in Phoenix by Kylie Sabra. 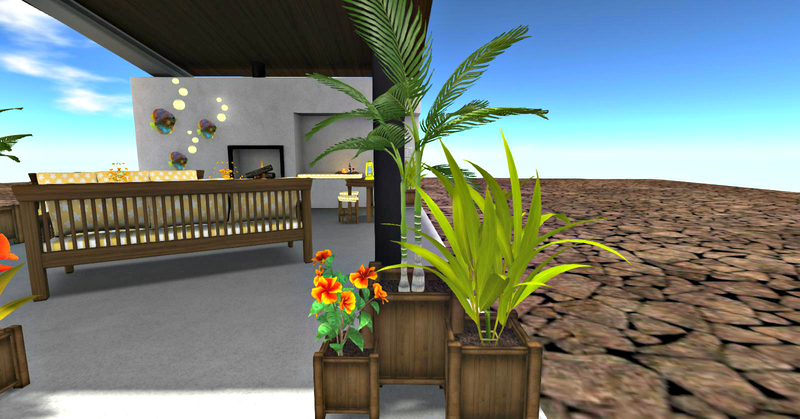 Have you been to the tony upscale Casa, where those in the know shop? 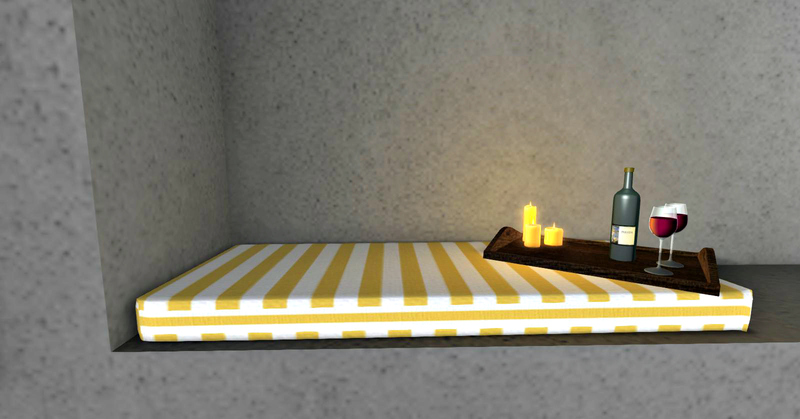 Kaerri has introduced and have on display, at Casa, Casa Limited Edition Pavilion & Furniture. This very chic set incudes everything to make your outdoor entertaining a fabulous and pleasurable experience! Do you see yourself and your guests seated upon the gloriously colored, yellow and white floral striped, mixed print cushion pavilion couch? As you catch up on gossip you lean across to sniff the beautiful vase of Daisies, that you placed on the pavilion tables. Such a scent of summer, you just can’t get enough! 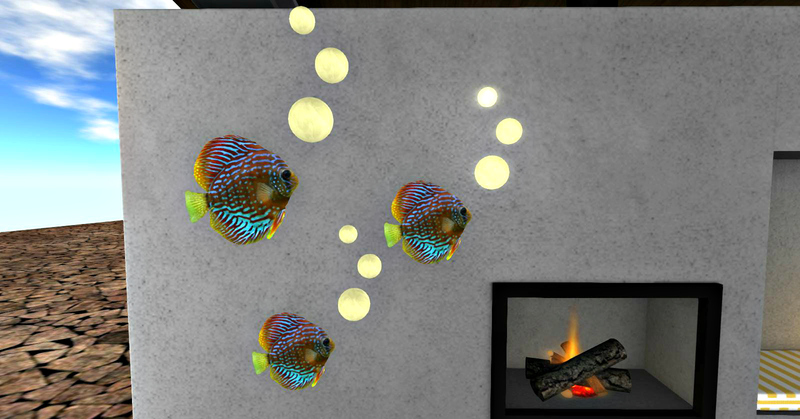 You look across and see your little ones trying to climb up to get to the amazingly realistic, brilliantly hue Fish lights with the Bubble Lights Set, as you had warned them about turning them on and off! You smile that special hostess smile of pride, as you notice the budding romance that is playing out, right before your eyes, on the yellow and white striped alcove built in settee, next to the lit fireplace, hoping that they are enjoying the tray of wine, and scented candles, you place there for them. 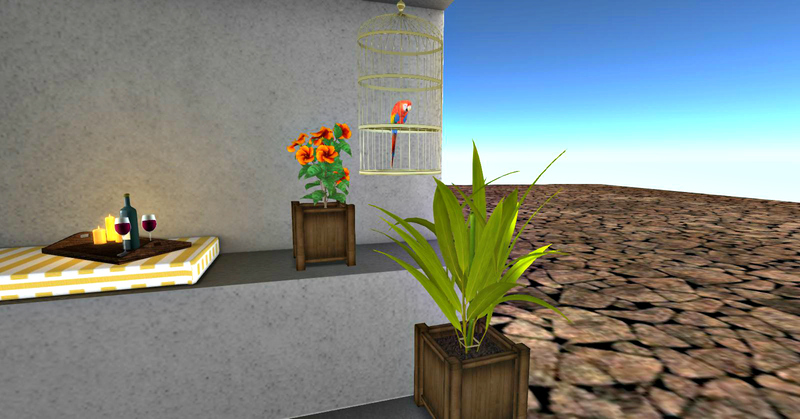 You see a couple of older teenagers poking and laughing, at your Brass Caged Talking Parrot and hope that they do not knock over the Hibiscus Planter in their jostling of one another and wonder if you should go over there. As you are walking over to take the yellow Hurricane Lantern from the Patio Table, so you can begin to serve lunch, you notice that someone has dropped a coke can in the single Shrub Planter on the side of your bird. 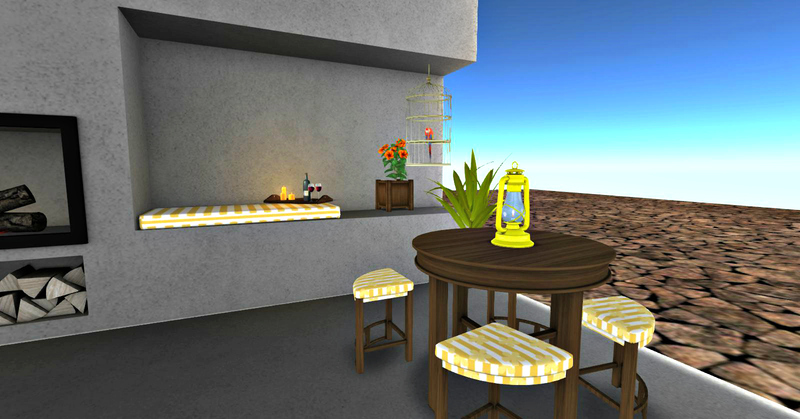 You send your partner to get more yellow and white floral stripe stools for the table and decides you need another table as well. 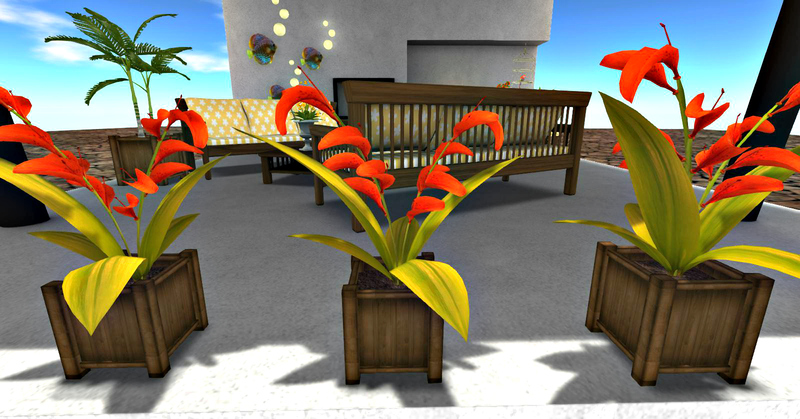 As you walk around your pavilion, talking to your guests and seeing to their comfort, one inquires about your Triple Plant and Lily Planters, how healthy and great they look and wish to know your secret for their care, as hers always dies. You smile, as you bend over to retrieve a small one’s little gym shoe from the single Palm Planter as you divulge family secrets and get more gossip! Everything you see, in this, leisurely chic, comfortable and inviting, Pavilion is included! There are so many furniture placement arrangements, you can come up with, that will be pleasing to your eye and suit your very discriminating taste. 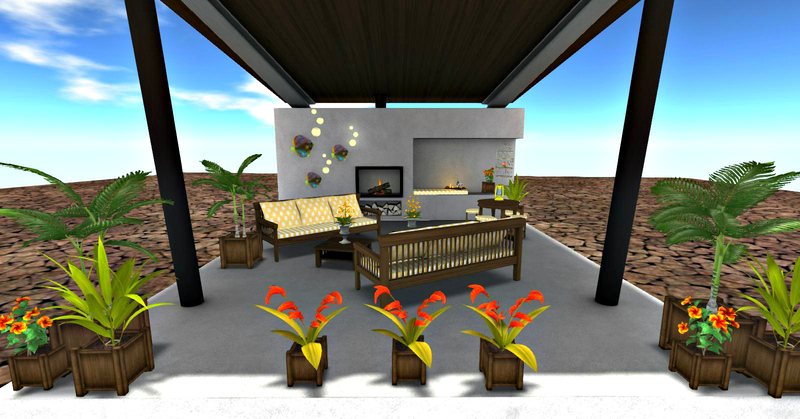 Such a wonderful afternoon of entertaining can be yours when you purchased this very limited in number, Casa Limited Edition Pavilion by Kaerri! Casa is a new, upscale shopping destination aimed at the high end, fashion conscious home and garden shoppers. Psssst! No one would ever guess…..
Be sure to head over to ghee, at Regal Estate, to pick up this charmingly summer chic exclusive dress, so you too can be jet set F A B U L O U S!